The exciting aspect about this new cosmetic appliance is that it does not only allow people to feel better about themselves but it lets people choose which smiles they would like to have. They are able to choose for example from such famous smiles as Britney Spears, Cameron Diaz or even Tom Cruise. A semi-permanent prosthesis - known as ''snap-in veneers'' - has now become available. Made of resin, the veneers are placed over patients' teeth, allowing them to flash teeth like those of their favorite actor or actress. The Snap-On Smile™ can help anyone with his or her cosmetic dental needs. 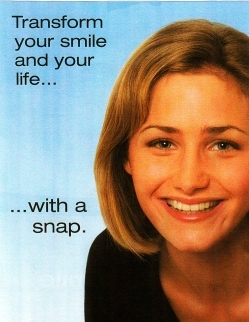 From a mis-aligned smile, to missing teeth or even ugly caps or veneers; the Snap-On Smile™ will make all these common problems obsolete! We recommend that you come in for a consultation and see if you are the candidate for this one-of-a-kind, state-of-the-art cosmetic appliance.